February 2015 – Tools for strategic and strong-minded thinkers! 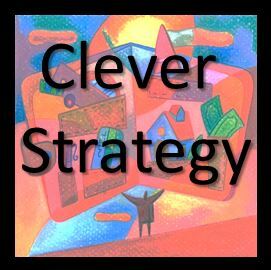 A clever strategy is one that blends action with limited resources to produce an effective result. The starting condition for a clever strategy has to do with stretch goals and with resources that are inadequate in some way. It’s the classic challenge for entrepreneurs. The appropriate thinking style is imaginative, pragmatic, and pattern-oriented. Don’t fixate on stretch goals. Mentally detach so that you can concentrate on the ways and means to get to that goal. The essence of cleverness is “Get more out of less;” to turn the “ordinary to the extraordinary.” Perfect strategy is not the goal; instead be satisfied with any progress towards your goal. A sense of playfulness and sense of humor can spark ingenuity, so have some fun. A new environment can help. Try lots of ideas. More unconventional ideas tend to spark clever strategy. Try to jam together “opposite ideas,” which often leads to a phenomenon called creative desperation. The concept of hacking can helpful. “The essence of a hack is that it is done quickly and is usually inelegant,” explains the Tech Model Railroad club at MIT (a group that was partially responsible for the internet). Have you applied any of these seven suggestions? What else do you suggest?